Funeral cars on Bury New Road. 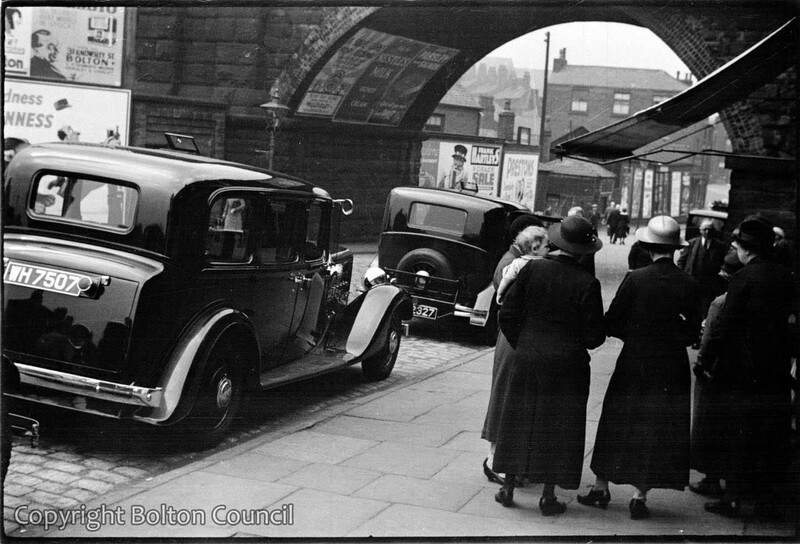 The road now passes under two arches of the viaduct and not just the one shown here. The buildings on the right here were removed in the 1960s and the road put in their place. Previously this was identified as Folds Road but several commenters have pointed out that the view is through the viaduct that crosses Bury New Road facing towards Canal Wharf. There is a photograph in the comments that shows the same area but taken from slightly further back. This photograph I believe is Bury New Road with Castle Street comming in from the left and under the bridge is Church Wharf. On Folds Road there are two arches (Blackburn line and the other to Astley Bridge Coal sidings and much higher if approach from town the cars would parked across Turner Street and in the other direction parked outside what became Marston Radiators there. The tracks for the Tonge Moor tram would have still beenin the road since when they were removed it was resurface with asphalt. I think you might be right that there is a question mark over the location of this picture though I’m not convinced that is under the viaduct at Bury New Road (I walk under it every day). I did a bit of looking around using Google Street view but haven’t been able to find an angle that matches. I wonder if there are arched railway bridges elsewhere in Bolton that might be good candidates – particularly where old rail lines have been removed. Both Don and Norman are right. The front funeral car is parked on Bury New Road, close to the junction with Plevna Street. The brick built urinal, opposite, together with all those shops, disappeared when work started on St Peter’s Way in 1969/70. 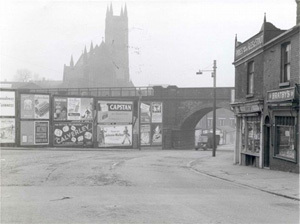 The advertizing hoardings, on the far left are actually in Dorset Street. Castle Street would be behind the photographers left shoulder. Looking through the arch, there is a good view of Church Wharf. The first building on the left is, possibly, the terminal warehouse of the M.B. & B. Canal. The large three storey building is definately the Bull and Wharf Hotel. The buildings/chimneys, rising to the left, behind the top storey, through the haze, are on Church Bank, facing the wall of the Parish Church. I used to live on Bury New Road, before Church Wharf was buried. It looks like the mystery is solved, here is a picture from Bolton archives but taken from further back and a slightly different angle (possibly at the junction with Castle Street). Thank you to Don, Peter and Norman for sharing your local knowledge and correctly identifying the location. You can really appreciate how much the area has changed.